Help in storing OST mailboxes in so many web emailing clients like iCloud, Yahoo, AOL, Google Apps, Outlook.com, and Gmail. Features fully Explained, Give a look! If you have purchased the application then we rest assure you about reliability of this application. You won’t come across any data loss like cases in any situation. It simply converts from OST files into EML file format and hardly affects the working emails. As soon as you access converted emails in EML file format, you will be able to open files and can work with the data again. If you have invested in the application then be rest assured about the functioning of the tool. It makes data migration comprehensively and leaves no single data at all. It supports migrating email properties etc and metadata info too. You can run the tool in any of the Outlook Express versions such as 5.0 and above. Thus need not to bothersome while opening already converted emails in PST file format. In order to know all about the functioning of Sysessential OST to EML utility, you can download the application in free of cost trial edition. The edition will help you to avail all the details in advance prior making purchase of the application in licensed run. The version is useful when you want to know all about features of the tool. The demo will migrate first 10 emails from OST into EML which gives you fair idea regarding tool’s functions. Sysessential OST to EML converter tool is created keeping in view both technical users and non-technical users. The features are absolutely crystal clear but still if you wanted to explore the features personally then download the application in free of cost trial run. You will get fair idea how software runs and migrates OST files in EML file format. 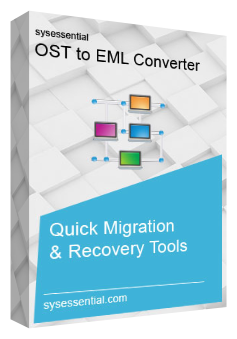 In free trial edition, you will attain view of the process software migrates OST files in EML as software migrates first 10 emails from OST onto EML. How far application helpful for non-techie users? Software produces same results no matter that user is technical or non-technical. You install the application and it start commencing the steps of exporting OST into EML file format. The steps are automated and well-understandable which is like a benefit for non-tech users as well. Is tool supportive of all Exchange editions or else work with some specific editions? Software is compatible when it is to work in Exchange environment. It works with complete accuracy when operated on any of the Exchange versions. What are the Outlook editions with which software works in ease? Software is supportive of all Outlook versions thus it hardly affects which specific Outlook version you are utilizing on your machine. It will work seamlessly on all editions. What is the cost of the licensed edition? Obtain cost details from support team. Before you order the tool, read inside our details from the main website such as cost of the tool and so on. However, still you are welcome at support section where you can call anytime and from anywhere. You can expect quick response from support executives. How about working of the software? I am an entrepreneur and fall into the need where I want to migrate OST emails into EML file format. After putting so many efforts, I found Sysessential for OST to PST so that email migration task can be performed. The application was excellent to use and I became happy with the flawless email conversion. I liked the way software actually works, simple in execution and hassle-free features. One day I got into the requirement for migrating OST emails into EML file format. I started using manual steps but to no use because method was really wrong and tiring. This led me to make a search for some specialized software such as Sysessential for OST to EML application that has converted all the emails into EML with ease. Conversion took place speedily and systematically for sure.